This novel in verse, written by the Printz Honor Book author, Helen Frost, once again brings a story to life by her use of the two voices of teens. One is the son of a settler living just outside the fort and running the trading post. The other is the son of a Native Miami tribe living just miles away. The story is set in 1812 during the westward expansion. She uses Salt to weave the story together in many beautiful ways. 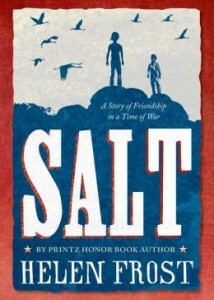 As salt comes from the earth and is needed by animals, Native Americans and settlers alike. The two young boys are friends, until miscommunication causes them to doubt one another’s intentions. It is skillfully written to allow the reader to discover how easily miscommunications can come about and cause a serious rift in a friendship or an escalation in war. Fifth grade readers plus older readers will enjoy this story and it would lend itself well to a reader’s theater in English, History or Social Studies classes. There are many areas of the common core that this book will fulfill and enhance. Literacy skills included, besides others, are inferential details, parts to whole, comprehension and cause and effect. It would also provide for some strong writing activities dealing with; which side would you be on? What parallels to this do we see in today’s world? How can some people see so clearly what others cannot? For a more contemporary experience with the novel in verse using two voices, see Hidden by this same author.